Come hear how Ms. Solis' experiences have shaped her vision for transportation. 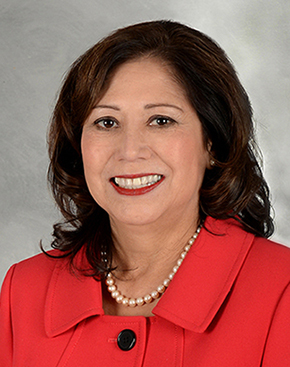 WTS-LA's March luncheon event will feature Supervisor Hilda Solis. Prior to her election as Supervisor, Ms. Solis served as a member of the US Cabinet, Secretary of Labor, and before that, as Congresswoman representing the 32nd District of California. She is a recognized advocate for working families and, as a new Metro Board Member, is working with her colleagues to ensure that our regional transportation system provides greater access. Two blocks from the Metro Red/Purple Line stop at Pershing Square Station. Accessible by DASH B. Valet parking is $22 at hotel with validation. Parking is also available at Pershing Square for $10. Reservations must be received by 5pm, Friday, March 2, 2015. Cancellations must be made by 5pm on March 2nd in order to receive a refund. For more information about this event or WTS-LA, visit www.wtsinternational.org/losangeles.